China and Kenya have signed a series of bilateral cooperation agreements worth $5 billion ranging from finance, environmental protection to renewable energy. This was announced after the meeting of Kenyan President Uhuru Kenyatta and Chinese President Xi Jinping in the Great Hall of the People in Beijing. The funds will be used for an energy project, and the construction of a railway project linking the port city of Mombasa to its border town of Malaba. Kenyatta said this “would provide better access to markets to goods from Kenya as well as Uganda Rwanda, Burundi and eastern Democratic Republic of the Congo”. Xi, on Monday, urged the two nations to maintain close coordination to “safeguard the legitimate rights of the developing countries”. “China is committed to making joint efforts to boost the partnership with Kenya”, Xi told Kenyatta. “Shared aspirations have brought the two nations together”, Kenyatta said, noting that Kenya treats China as “a real friend and important partner”. According to US-based AidData, road-building and other transport projects accounted for nearly half of China’s assistance to Kenya in the last decade. The American research firm says China provided Kenya with a total of $1.4 billion in aid from 2001 to 2011. During a recent high-profile three nation African tour, US President Barack Obama skipped Kenya, despite ancestral connections to the African country, as President Kenyatta is facing an International Criminal Court (ICC) trial on charges of ‘orchestrating tribal violence’. Kenya’s electoral body declared Kenyatta as the president of the Republic of Kenya in March this year after he won 6.17 million votes in a historic election, the first to be organised under Kenya’s 2010 constitution. “We expect the international community [to] respect the sovereignty and democratic will of the people of Kenya,” Kenyatta said after the election. “The Africa star is shining brightly, and the destiny of Africa is now in our hands,” he added. China congratulated the new Kenyan president after he assumed office, in contrast to skeptical reactions from the United Kingdom and United States. “China is willing to boost cooperation with the new Kenyan government in order to boost ties and benefit the people of both countries,” Chinese Foreign Ministry spokesperson Hua Chunying said previously. 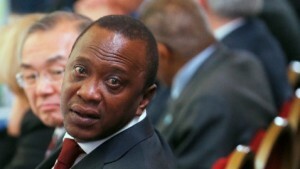 British officials had warned before the election that it would have only “essential contact” with Kenyatta if he was voted into power. “Choices have consequences,” warned US Secretary for African Affairs Johnnie Carson in reference to Kenyatta before Kenyans went to vote in the crucial elections. East-Africa’s biggest economy recently discovered large reserves of oil and gas, and according to the International Monetary Fund (IMF), the country’s GDP will grow at 5.6 per cent in this year.